The following article will help you set up Continuous Deployment to Azure using Buddy. Why do I need Continuous Deployment? Deployment preparation is getting more time-consuming as more time is needed for preparation. Software iteration is getting longer with every release, which results in less feedback from the client. Testing is more difficult as every team member has their own development environment. Team members need to communicate more often, increasing the risk of communication errors. The problems above can be successfully addressed by introducing a build server and deployment automation to your workflow. What does it mean for the development process? The software is built and tested in one consistent environment, avoiding dependencies on local dev boxes. You save time on setting up builds, installing required software, etc. Having one centralized build server provides easy access to code metrics, making it easier to properly cover your code with tests. Automatic deployments allow you to release software and receive feedback more often with the whole process simplified to minimum. As you can see, these are some serious advantages one shouldn’t reject easily. The following guide will tell how to use Buddy to apply Continuous Deployment to your projects so you can benefit from all of the above. Prepare your project by packing into a ZIP archive. Alternatively, you can download and use our sample .NET project available here. If you host your projects on GitHub, Bitbucket or GitLab, you can choose one of them as the provider when setting up a new project. If you’re a GitHub user, you can fork our sample project from our profile and select it from the project list. If you’re not familiar with Git, this guide will get you started. Go to your web app’s blade and click Overview. There will be a Get publish profile link on the top. Click it to download the XML file with publishing data. You can also set the trigger mode to manual or recurrent if you don’t want to update the Master every so often. You can read more about setting pipeline details here. Make sure to provide the data from the publish profile with publishMethod="MSDeploy, not publishMethod="FTP". But are we sure the code that you send is properly verified for errors? Go to the image settings and change the image from ubuntu to mono official. Click Update to save changes. Congratulations! We’ve just created a pipeline that on every push to branch automatically tests and delivers your project to Azure (provided the tests went through successfully). The pipeline is very simple: you can add more actions to the pipeline if you wish - for example a notification to your Slack channel - or read more on the concept of pipelines in our dedicated guide. 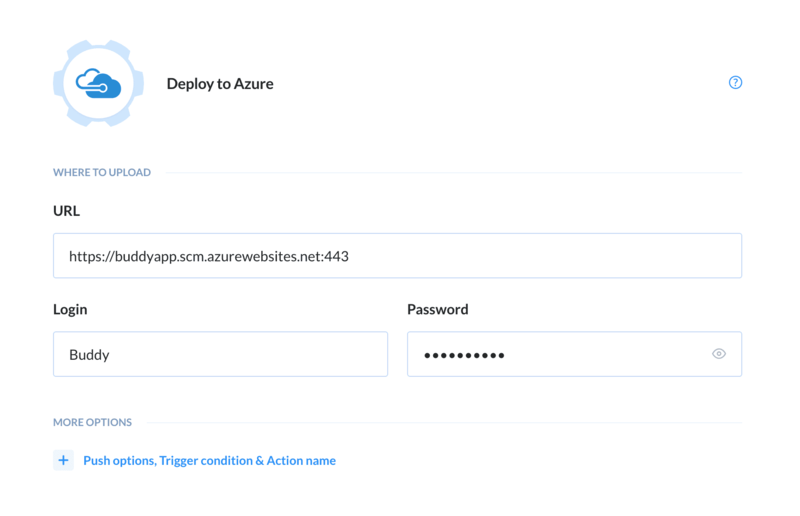 Set up Continuous Deployment to your Azure instance in 10 minutes.